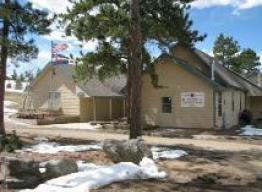 Opened in 1896, Stove Prairie School is the oldest operating “one-room” school in Colorado. Stove Prairie joined PSD in 1960. Now one of the three mountain schools, this little school “at the end of the rainbow” offers a multi-grade learning environment. Kindergarten classes are full day and tuition free. Preschool is available on site for children ages 3-4 up to three days per week. Stove Prairie offers a challenging math program and learning opportunities that focus on literacy instruction, including a rigorous reading series with a literature-based component and integration of reading and writing. Classroom laptops and a media center complement all instructional areas. Art, music, and physical education are taught weekly. The PTO supports Stove Prairie through fund-raising events such as the annual Winter Festival, always on the first Saturday of December. Proceeds provide many opportunities to students, such as field trips, classroom needs, library books, and media programs.